It has been a few decades since I was in Vienna during November and I had forgotten – if I ever knew – that November is the month here for eating geese. 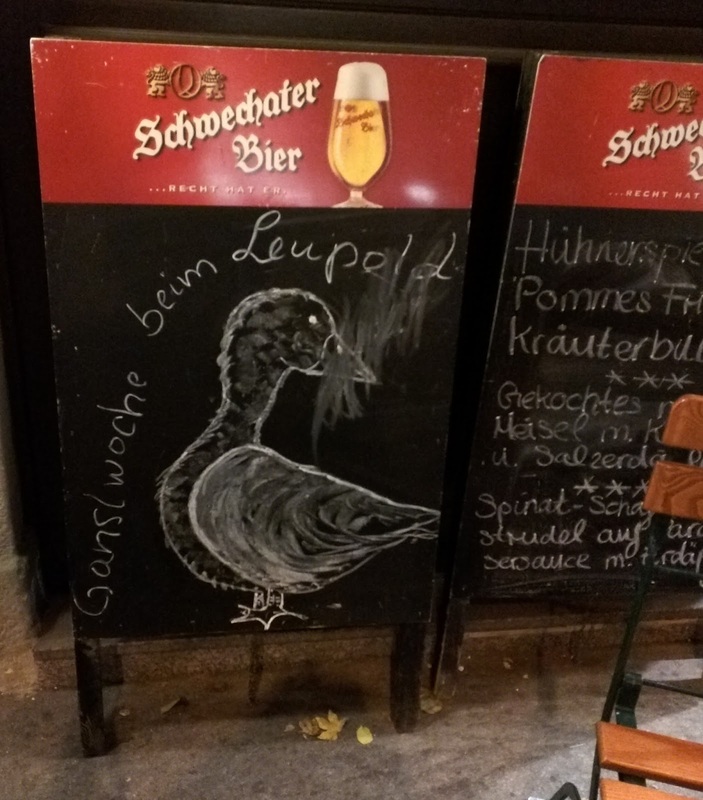 In Austria, the word for goose is Gans or Gansl or Ganserl, and at the beginning of the month, I began to notice that the menus of many restaurants featured soups and main meals made of these creatures. I was curious why November is the month for eating goose meat. 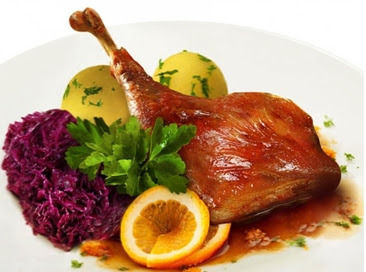 I knew that duck (Ente) is served in various forms throughout the year, but had rarely seen Gans on Viennese menus when I was in Vienna in March or April or December, the months I usually visit the city. A little research shows that cooking geese in November is a long tradition not only in Austria, but other European countries with large Catholic populations. In its purist form, the tradition calls for meals from geese to be served on November 11, the celebration day for St. Martin (Namenstag des Heiligen Martin) who was born in 316 and was a Roman soldier before becoming a priest and bishop of the Catholic church (see https://en.wikipedia.org/wiki/Martin_of_Tours). Not only is the consumption of geese a matter of celebrating the name day of a saint, the time also coincides with the waning days of the harvest season when geese have had months to fatten and farm work is coming to an end. According to a newspaper story in the Kurier (November 8, 2015), the religious and secular traditions of eating geese in November was first mentioned in texts written in 1171. It was noted that the work year for farm workers (who labored for land owners) ended on November 11 and they each received a goose as part of the payment for their work. Over time, serving geese at meals was not limited to November 11, but also a week or two before or after that date. Each restaurant decides the period of time it will feature Gansl or Martinigansl; generally it can be found in different restaurants throughout most the month. …as a harvest festival. Events include art exhibitions, wine tastings, and live music. “Martinigansl” (roasted goose) is the traditional dish of the season…The nights before and on the night of Nov. 11, children walk in processions carrying lanterns, which they made in school, and sing Martin songs. The celebration is, apparently, a popular one. According to the Kurier newspaper (November 8, 2015), Austrians consume about 500,000 geese each year, with 90 percent served in the weeks around November 11th. In 2014, Austrians ate 2,377 tons of dead geese. Of the geese consumed in Austria, only 17 percent are produced in the country. The other percentage is imported from countries that have less stringent regulation of how geese are raised. Among its recommendations is the restaurant in the elegant hotel, Park Hyatt, located at Am Hof 2 (http://www.vienna.park.hyatt.com/en/hotel/home.html). According to the article, the four-course Martinsgans meal was available evenings from November 6 to 15. It cost 72 Euros without drinks. A cooked goose (Ganserl), sufficient to serve four people, can be ordered and picked up at the hotel from November 1 to December 26. The cost, without side dishes, is 195 Euro. Gasthaus Heidenkummer lies in the middle of the eighth district and offers good, traditional food. Here you can get a Martinigansl until November 22 for a reasonable 16 Euros. In addition, in the afternoons you can get a two course meal for about 6.50 Euro. The Gasthaus is decorated in traditional dark wood and is very comfortable. http://www.vienna.at/ganslessen-in-wien-die-besten-lokale-fuer-den-traditionellen-martini-genuss/3759336. This site also mentions an eight district restaurant that I have long liked, Café-Restaurant Hummel (http://cafehummel.at/) at Josefstädter Straße 66. 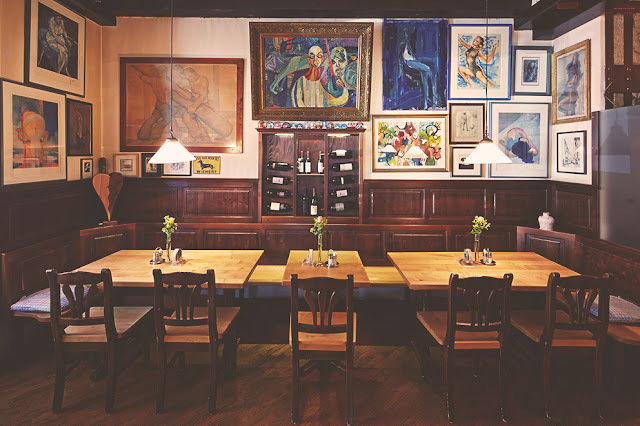 The article says that "from November 7th to the 15th, one can enjoy Martini-Gansl at the Hummel, with traditional side dishes of dumpling (Knödel) und red cabbage. The pleasure of the meal will be enhanced with glazed chestnut and a cranberry pear." It appears that if you are a fan of goose meat, the time to travel to Vienna is November 11th or thereabouts, as soon as you finish harvesting your crops.